The algorithm, oh the algorithm. Let’s jump right into everyone’s favorite Instagram topic, shall we? Yup, the Instagram algorithm. If there’s one topic that’s been on every blogger’s mind, it’s most definitely that persky Instagram algorithm and its negative impact. I’ve heard bloggers say the platform is worthless, that the algorithm is unfair, and some have even suggested giving up on IG altogether. Ouch. But hey, I totally get it. We’ve all seen that drop in our engagement and reach, but here’s the deal: Instagram still matters. Like a lot. Today I’m going to remind you why Instagram still matters, why you should stop focusing on numbers, and the way you need to start using this powerful little platform. This post does contain affiliate links, meaning I may make a small commission at no extra cost to you. Just know I only promote the products I truly believe in. Thank you for supporting Hustle and Hearts! First let me make this clear: I don’t have a massive Instagram following, I don’t get a ton of traffic to my blog from Instagram, and my reach isn’t anything worth bragging about. Uh okay… so you might be wondering why exactly I think being on Instagram as a blogger is worthy of not only my time, but also your time. It took me a while to really understand this, but I’ve come to realize that Instagram is not about your numbers. While yes, of course it is nice to see that little follower count go up, while simultaneously having the likes roll in, what’s even more important is having the right people follow and engage with you. Whether that’s 1000 people or 10,000 followers really doesn’t matter that much. What does matter is that whether you’re in the 1000 follower camp, or the 10,000 follower camp is that you’re fostering connections with the right people. Let’s say you’re in that 10,000 follower camp, and you have a ton of male fitness bloggers following you, but you primarily write for moms navigating motherhood. What good do these male fitness accounts do for you? They’re not even close to being your target audience. Short answer: they do nothing for you, except maybe give you a little ego boost (harsh but true). Now let’s say your female fashion blogger targeting millennials, and you have 1000 followers who are all primarily millennial females with an interest in fashion. Who do you think is better off? 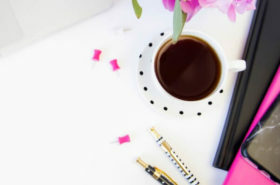 While that account with 10,000 followers might look good on paper, it’s much more likely that the fashion blogger is going to be able to grow a loyal community of readers, setting her up for a better chance to start making money from her blog. Okay, so now that we understand that numbers don’t necessarily matter as much as we might think when it comes to Instagram, let’s talk about why specifically Instagram is worth your time. I’m all about being selective with your time. Ain’t nobody got time to be on every social media platform promoting content 24/7. Well, maybe some people have this kind of time, but I most certainly don’t. I strongly believe Instagram is the best chance you have to connect with your current audience, meaning no, it might not be how you gain new readers, but it’s certainly one way to keep your current audience engaged with you, your content, and most importantly, your brand. You want people to “fall in love with you”, so to speak. And Instagram let’s you do this. While there are other social media platforms that also allow you to do this, I believe Instagram is probably your best bet. Because humans are visual creatures. 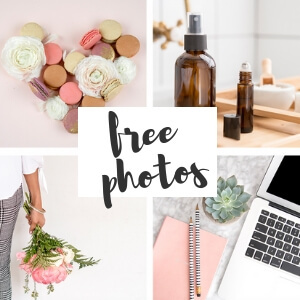 If you can create a feed full of beautiful images that are catered to your brand, you’re on the right track to reminding your audience why they followed you in the first place. Of course there are more components to it than just pretty images, but like I said, if people can just look at your feed and automatically feel a connection, you’ve won half the battle. Also, it’s important to keep in mind, while this may change one day, Instagram is probably the first place you go when you want to connect with a blogger, a brand, an influencer, or a celebrity. When you want to get to know a person or a brand beyond the surface level, you follow their Instagram account. Plain and simple, right? If you don’t have an Instagram account, you’re not maintaining your Instagram account, or your feed is a total disaster, well that person will potentially reconsider whether you’re worth following. Create great content on your Instagram. Be inspiring. Post beautiful images. Write relatable captions. Film valuable videos. Whatever it is that you do well, do it for your current audience and watch as they reward you with engagement. And don’t forget, better engagement means it’s much more likely Instagram rewards you as well, meaning you’ll start showing up in the feed more often. It’s a win-win. 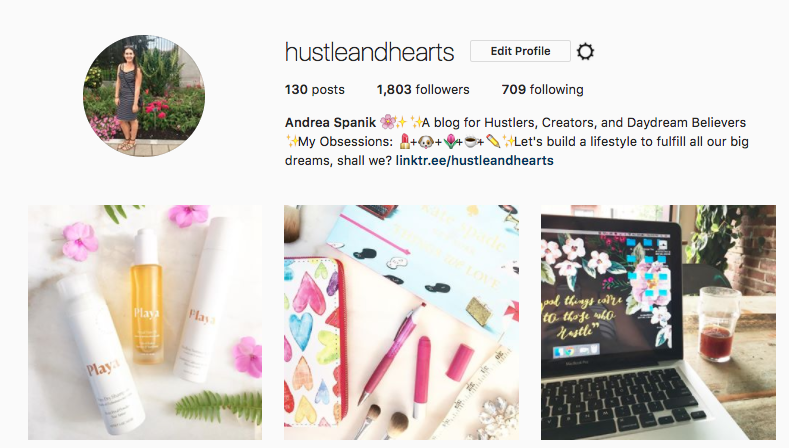 You can follow me on Instagram @HustleandHearts. I’d love to have you! I’ve been blogging on Hustle and Hearts for about 8 about months now, and in that time I’ve been able to build connections with some pretty awesome ladies, and for the most part, I have Instagram to thank for this. A couple months ago I was on Pinterest and stumbled across an article that seemed interesting. I clicked on the pin and was redirected to a blog. I read through the article and liked what I read. I then noticed the picture of the blogger on the sidebar. It took me a moment to realize from where, but it was from Instagram. This got me curious so I started clicking around on her blog. 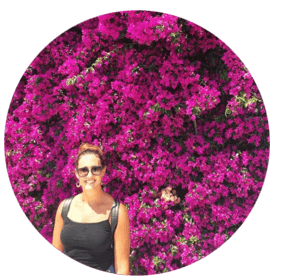 I read her About page and realized how similar our blogging journeys and missions were. I then found myself totally consumed by her content and reached out to her. This blogger was Kate from Layered Indulgence, who I would now consider one of my blogging friends. I probably would have never made that connection if it would not have been for Instagram. And yes, while this won’t happen all the time, it does go to show the benefit of spending your time on Instagram. 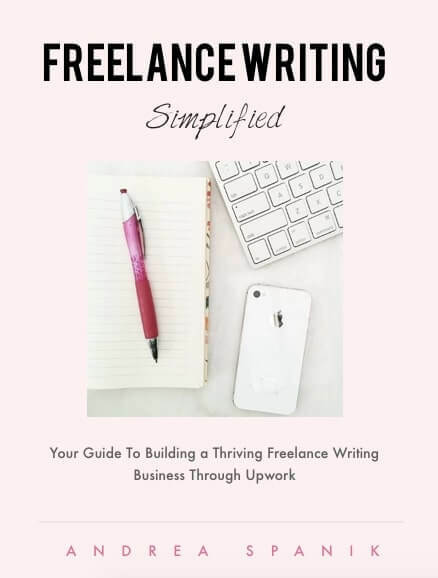 Because Kate made an impression on me through her Instagram account, I remembered her once I stumbled across her blog, giving her both a new reader and a new blogging connection. Definitely a good reason to spend your time on Instagram, I would say. If you’re in the camp of ladies who have given up on the platform, I hope this article has given you some inspiration to get your booty back over onto IG. If not, I’d love to hear from you to understand why you don’t think Instagram is worth your time. Perhaps I’m missing something. 1) Don’t be afraid to send a DM during an Instagram Story. Trust me, you’ll probably make someone’s day if you reach out. Did a fellow blogger post a really relatable story? Can you answer a question they asked in a story? Or hey, maybe you’re just loving the top they’re wearing. Say something! When you send a DM, it has a much more powerful impact than a mere like or comment. 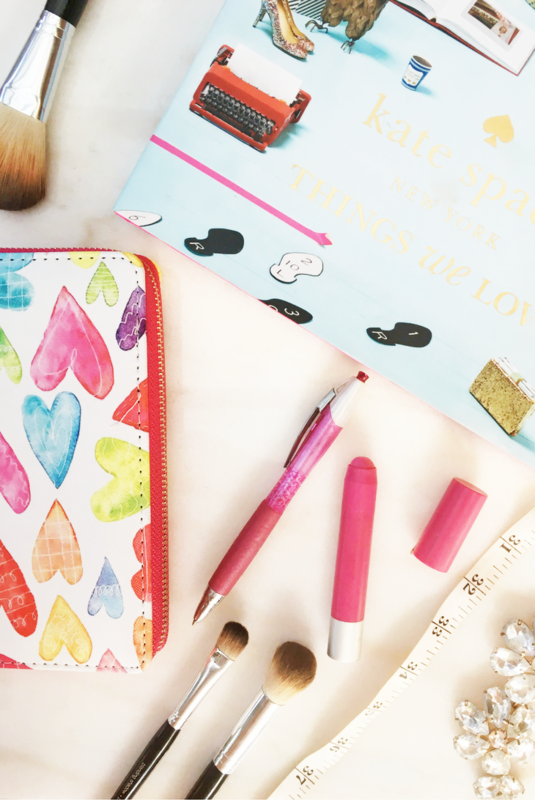 You could make a new blogging friend, or gain a reader! Either way, both these things are great for growing your blog. IG stories are a great way for your audience to get a little behind the scenes action of not only your blog, but also your life. 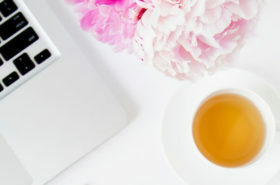 Because hey, we all lead lives outside our blogs and businesses, so let people inside to connect with you and your life. Building connections is the key to true engagement with your audience. Not to mention, I always notice a little spike in my engagement when I regularly create stories. PRO TIP: Keep in mind that video content is becoming extremely popular in the “influencer” community, so make use of Instagram videos and lives. To be honest, I wouldn’t be surprised if brands start focusing their marketing efforts primarily on Instagram stories, so if you’re looking to start making money from sponsored content, this is probably a great area to get skilled with now. When it comes to following accounts, please don’t just follow anyone and everyone. I’ve mentioned this in some of my previous Instagram posts, but when you have a giant “following” number…well, it kind of makes you look desperate, like you’re just looking for people to follow you back. When deciding who to follow, look for accounts that inspire you, but also look for accounts that you feel are well suited for your content. For me, since I primarily write for millennial women who lead creative lives, I look for fellow bloggers. 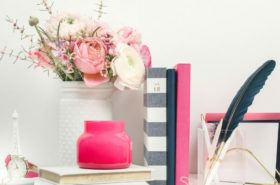 I’ll look for fellow blogging ladies who I think I could connect with on a personal level, but I’ll also look for those who I think I might be able to help. The key here is to know your audience, beyond the surface. Most importantly, you should know their hobbies, interests, goals, worries and troubles. This will help you cater your content to that specific target. I could probably go on and on about Instagram, so I’ll stop myself here…. 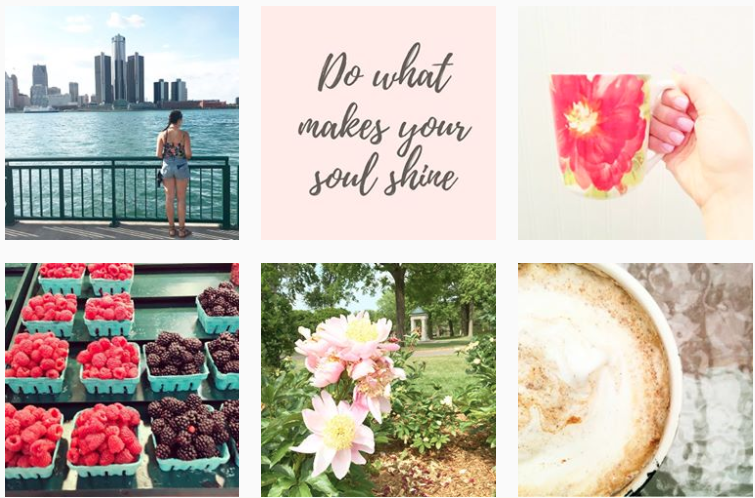 Instagram is without a doubt my favorite social media platform, and even though it doesn’t bring me much traffic to my blog, I still one hundred percent think it’s worthy of my time as a blogger. What about you? 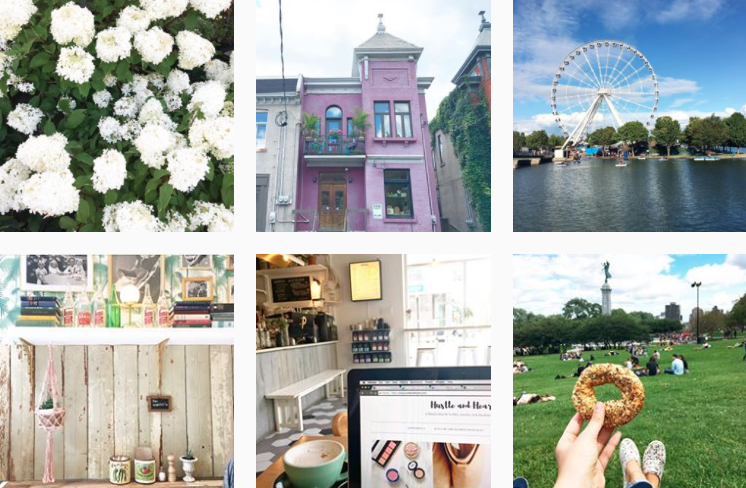 Has the Instagram algorithm frustrated you enough to make you consider quitting the platform? 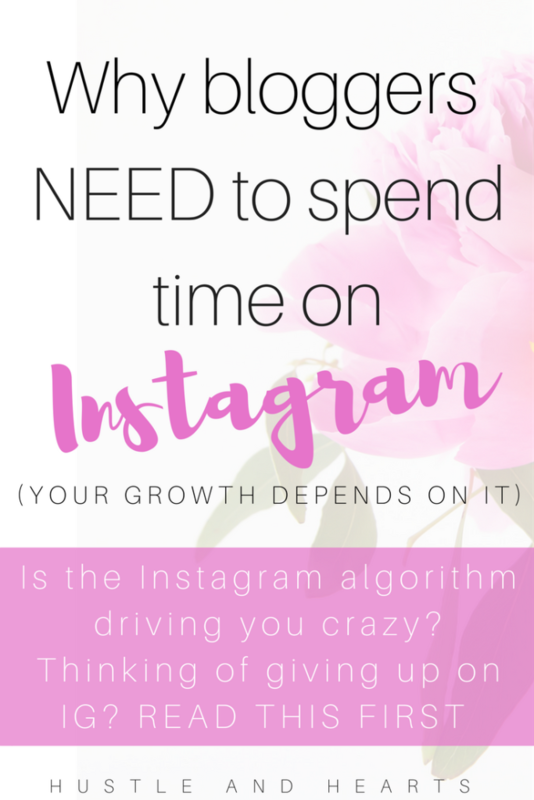 I’d love to hear your thoughts on the Instagram algorithm and how you think it has impacted your blog. If you’d like some more IG tips, be sure to check out my posts on (1) beating the Instagram algorithm and (2) Instagram growth hacks.